Thanks to television, you're probably familiar with dog shows; however, cat shows, like cats themselves, are a bit of a mystery to most people. 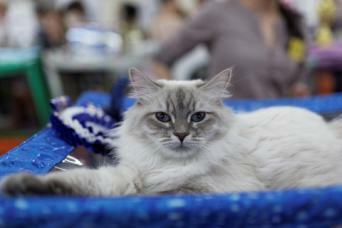 Peek behind the scenes at a cat show, and you'll see a few similarities and some significant differences. Cat shows are sponsored by breed registries, which keep records of cats' pedigrees. The three best-known cat registries are the Cat Fanciers' Association, the International Cat Association, and, in the U.S. only, the American Cat Fanciers Association. Their affiliated clubs throughout the U.S. and abroad host the shows. 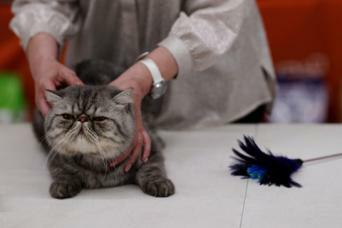 The cat show season runs from May through the following April. Shows can be one or two-day events, and often draw large crowds. 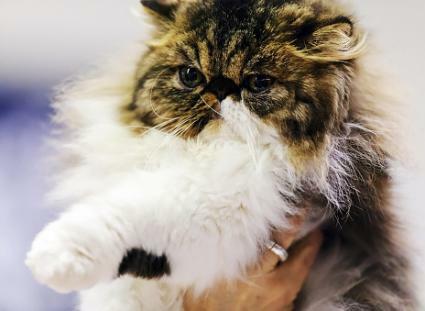 In November 2015, the Cat Fanciers' Association's International Cat Show drew 5,000 people and more than 700 cats, the Philadelphia Inquirer reported. Cat owners should submit their entry forms early, since the information goes into a show catalog and judges' book used at the show for awarding points. In the weeks leading up to a show, a cat may get a weekly bath to make its coat soft and shiny. On the day of the show, an owner will generally groom her kitty before leaving home. However, a savvy cat owner will bring along a comb for touchups just before showtime. Also, show rules require that cats' claws be clipped. Backstage at a cat show, each kitty relaxes in a cage that's been outfitted with show curtains. These can be as simple as towels pinned around the sides of the cage, but many exhibitors go all out with fancy curtains of satin or velvet in colors that flatter Fluffy. The curtains serve a practical purpose, though, by keeping the cats from seeing each other and possibly getting overly excited before the show. The cage also has food and water, a bed and a litter box. Spectators are allowed into this staging area to see the beautiful, exotic contestants up close and chat with their owners. Cat owners and breeders also take the opportunity to meet or reconnect with one another. After the owner gets her cat settled into its cage, she waits for the cat's assigned number to be called over the loudspeaker. Then it's time to head for the show rings. The show hall is set up into several stations called rings. A judge, trained and certified by the sponsoring association, is stationed at a table in each ring to examine and handle the competitors. At smaller shows, which typically have between 100 and 200 entries, cats are judged in at least two rings. At larger events, which can draw more than 400 entries, cats will have to be judged in at least four rings. Rings for both long-haired and short-haired cats are called allbreed rings. Rings that are for only one particular coat length are called specialty rings. The judge takes each cat, one at a time, out of its cage, stands it on the judging table, and looks for characteristics outlined in the written standards for each breed. These include head shape, bone structure, and coat color and texture, as well as overall health and condition. The judge also looks for a calm, happy personality. She picks up and holds each cat, and may dangle a teaser toy in front of it to see how it reacts. The ideal cat is alert and playful. On the other hand, uncooperative or threatening behavior is grounds for disqualification. Judging takes place in all the rings simultaneously. The judge in each ring awards points to each cat. When she has judged all the cats in a class, she selects her top 10 and Best in Show. The cats in that ring then move on to the next one. After every cat is judged in every ring, each cat's points are tallied. In a grand finale, the presiding judge announces the overall winners. In all three of the main cat associations, a cat's points from each show are added up for the entire show season. 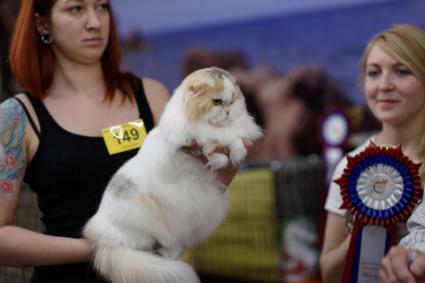 At the end of the season, the associations honor their top-scoring cats and award titles such as Best of Breed and Best of Color. In addition, each region in an association names its top regional winners. Unaltered cats that accumulate many ribbons in the course of their competitive careers are highly desirable for breeding in hopes of producing future champions. Their kittens may sell for hundreds of dollars. If you'd like to see for yourself how cat shows work, or even enter your own fabulous feline in one, check out the Cat Fanciers' Association calendar, the International Cat Association calendar, or the American Cat Fanciers Association calendar to find a show near you. Portions of the admission fee, which is typically about five dollars, is often donated to local animal shelters.